Will Auckland become like Tokyo, and would that be a bad thing? Home / Affordable Housing / Will Auckland become like Tokyo, and would that be a bad thing? For the Easter Holidays I decided to visit Tokyo. This is the first time that I have been to Japan and while some of my preconceptions have been confirmed I have been pleasantly surprised by how well the city works. And as Auckland faces the problem of predicted significant growth rates for the next few decades I believe that Tokyo may provide some of the answers. Firstly some context. Urban Tokyo has over 13 million inhabitants or ten times the population of Auckland. It is twice as large geographically as Auckland City although this does not present a proper comparison as Super City’s figure includes the Gulf Islands and the rural areas in Rodney, Waitakere and Franklin. The city is extraordinarily clean and even though I have seen many local residents with white face masks I have found the atmosphere to be fine, even better than Auckland in many respects. Certainly better than every other Asian city I have visited. And there is no sign of perceptible air pollution. Blue skies have dominated while I have been here. China could learn a few lessons from this. There are no need for large TV screens showing the rising of the sun here as there are in China. The city’s rail system is even more astonishing than I thought it would be. I had preconceptions of white gloved security guards pushing harried passengers into overfull trains. I have not seen that happen yet although I have been on a few trains that were verging on being over full. And the numbers using the system are astounding. These are Wikipedia rather than industry figures but this article contains some astonishing statistics concerning use. In the greater Tokyo area there are 40 million passenger trips a day, if my understanding of the statistic is correct this is one per person. And annually the railway companies provide 13.5 billion train rides. Auckland’s figure of 17 million pales into insignificance by comparison. On a per capita basis the average Japanese takes 80 times as many train trips as their Auckland equivalent. Although our primary public transport provider is the bus this is still a significant difference. My first experience of the train system was catching a train from the Airport through much of the city to the hotel that I was booked in. I had fears and trepidations about the trip but there is plenty of information in English and without much difficulty and with the help of the City Rail Map application I was able to work out where I was going. The trains are run with ruthless efficiency. Many contain digital screens giving progress timing and even providing explanations if by some chance an individual train is running late. And they are regular. I have not found a need to check a timetable. I have only needed to work out which platform to stand on and invariably a train arrives in a short time. Augmenting the train system is a very usable bus system and at each major transport node the two are clearly integrated with the train system providing the backbone of the transport system. As for the city structure there are a couple of other matters that have really impressed me. The road system is adequate but not impressive. There are no highways of national significance here. Apart from a quaint collection of 1970s and 1980s Toyotas being used as taxis there are just not that many cars to see. I have not seen a traffic jam and the traffic on Rata Street in New Lynn is busier than anything I have seen in Tokyo. And the city is designed for walking and cycling. Footpaths are wide and comfortable and clearly the emphasis has been put on persuading people to ride on passenger transport and then walk or cycle. And I as pressed by how popular cycling is. There are all sorts and types of bikes from the old school, the family bike with seating for the kids all the way to stylish looking hipster versions. Although it is apparent that there are very few sports bikes. Obviously biking is a way of life rather than a sport for most people. In the centre of the city there is an intersection where the number of pedestrians outnumbers the number of cars by hundreds to one. This particular crossing is that impressive Trip Advisor has it as one of the most interesting things to see in Tokyo. And everyone walks. And walks and walks. The only congestion that I saw was on the footpaths. As for the people they are skinnier and healthier looking than us kiwis. All this walking and cycling is obviously having a beneficial effect on them although the infamous smoking rates may also be having an effect. The rest of the world always praises the Japanese diet and I am sure this is beneficial but a transport system involving lots of standing and walking must also help. 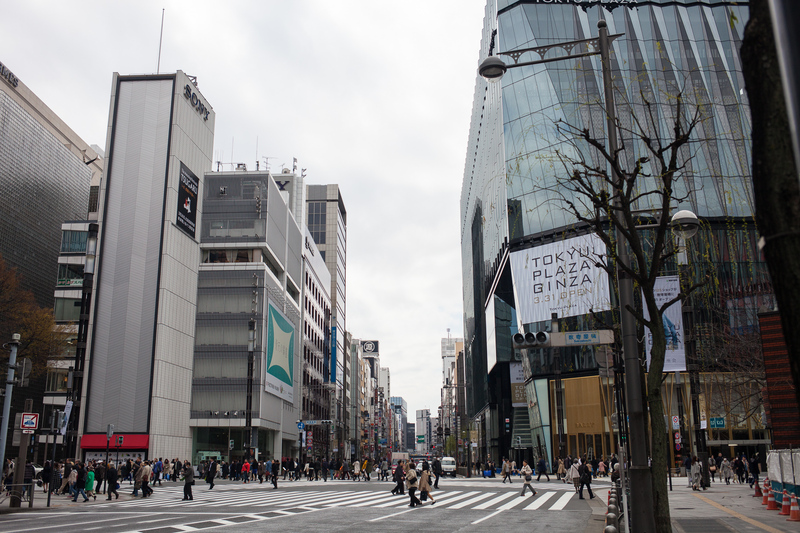 How would Auckland handle Tokyo level intensification? Not very well if recent Auckland Council decisions are an indication. The basic problem is that land use and transportation are deeply inter related. Tokyo style intensification would allow for an improved passenger transport system and reduced reliance on the motor vehicle. Urban sprawl instead of intensification would make public transport too expensive and cement in the dominance of the car, not to mention the never ending increase in congestion levels. And if you want to do something about climate change then electrified public transport has to be part of the mix. Overall Japan’s per head of population production of carbon dioxide was slightly more than half of New Zealand’s rate in 2005. And transportation accounts for 18% of Japan’s total CO2 output compared to New Zealand’s figure of 36%. So the lessons for Auckland? Congestion can be addressed and we can live healthier and more rewarding lives. But we need to embrace public transport, start reducing our reliance on the car and prepare for good quality intensification.